I told Deb we gotta go to Rehab, and she said “No, no, no!”. 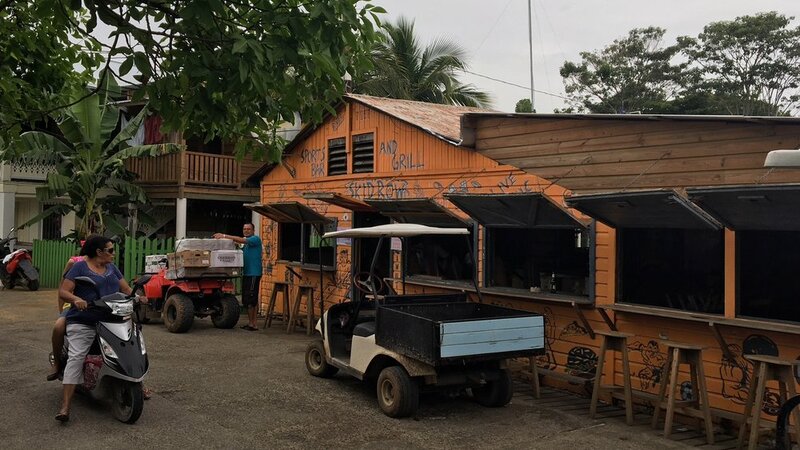 While this island is still figuring out how to transition from a fishing economy to a tourist economy, it definitely has figured out that tourists like bars and restaurants. Most of the bars here are either waterfront or very close. The ones that aren’t are usually super lush, green, sort of jungle themed, like the Treetanic. 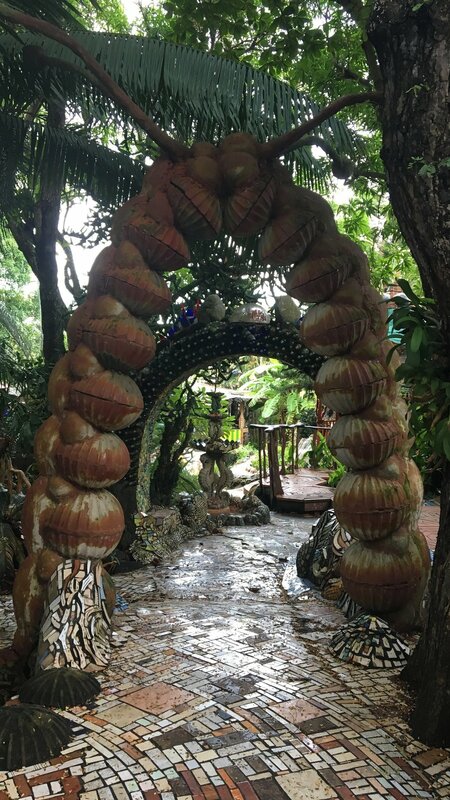 And it doesn’t much matter whether the place is waterfront or not, everything is outside with tiki-style thatched roofs, or other overhangs for folks to stay out of the sun, and stay dry when it rains. The two waterfront bars, Rehab and Relapse, clearly share the same ownership and similar concepts. Rehab is downtown in the middle of the action, but just off the busy street, sitting peacefully (during the day) over the water. It’s a favorite of ours because you can sit and watch the big boats come in and out during the afternoon, like the ferry (Utila Dream) and some cargo ships. Of course, you also see smaller boats like dive boats and fishing boats. They have Adirondack chairs, bench swings, picnic tables, etc. It’s very relaxing to sit and sip a cold one and watch the nautical world go by. You can also swim/snorkel there if you like, but I’ve never been a big fan of swimming in harbor water with the boat exhaust by-products. But yes, we definitely went to Rehab! We had to go to Rehab. It wasn’t that bad! Soon after Rehab, we found ourselves in full-on Relapse! 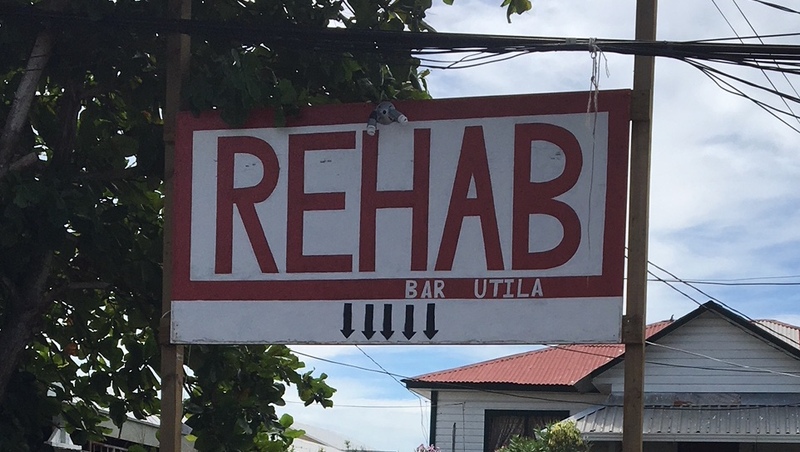 Rehab’s sister site Relapse is about a mile down the harbor right next to the public beach, the prettiest beach in the more populated part of Utila. The beach is kept clean, the sand is a nice light color and the water is clear. The bar sits at the east end of the beach, again out over the water and has serviceable tables and chairs. Swimming off the dock here is legit too, the water is as clean and clear as anywhere in town. If you look past the babe, you can see how easy it is to go to Relapse. And of course, after you Relapse, where else is there to go? You know you’re going to end up on Skid Row. Skid Row is in between the two, on the other side of the street away from the water. It’s got bar stools made from what looks like longboards (long skateboards). The draw here is supposedly doing shots to get the t-shirt, lots and lots of shots. I’m a beer kind of guy so that doesn’t appeal to me, and I’ve got enough t-shirts anyway. But what the hell, the place is almost famous for a reason – it’s pretty fun and friendly for a dive bar called Skid Row! Perfect example of dive bar status BTW: the mens’ room is out back, just out the open back door. It has no door on it, it was built that way. That’s just what you need when you have a bunch of drunk tourists who need to finish up and get back to the bar! Skid Row baby – yes it’s a dive bar, what else could it be? 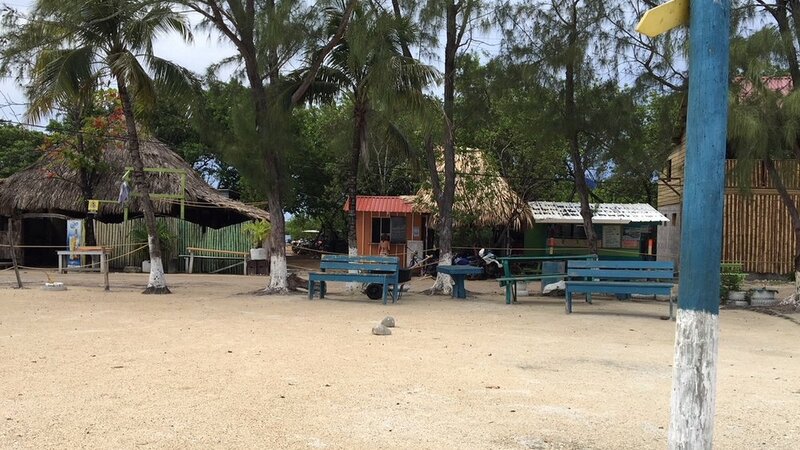 There’s also a nice beach bar at the other end of the harbor, on the private Bando Beach. It’s quiet and the drinks are good. They have a Bloody Mary that’s practically a 4 course meal, with sliders on a stick, vegetables, etc. all coming out the top. But the best things here are the barkeeps, a nice Canadian guy and a young woman from Chicago, they make it feel like Cheers where everybody knows your name. One standout, big, fat FAIL is a place called the Texas Mule. It’s a Texas themed bar, with brown wood walls and signs saying “Howdy pardner!” and telling you to park your donkey here, etc. It is over-water like the others, but I find the place comically out of place. Who goes to a tropical Caribbean island to go hang out at the Texas mule joint? I’ll tell you, it’s nobody. In a half dozen or more walks by that place I’ve not seen a single solitary soul walk into the place. Zero customers, despite a prime location and a solid, clean building. 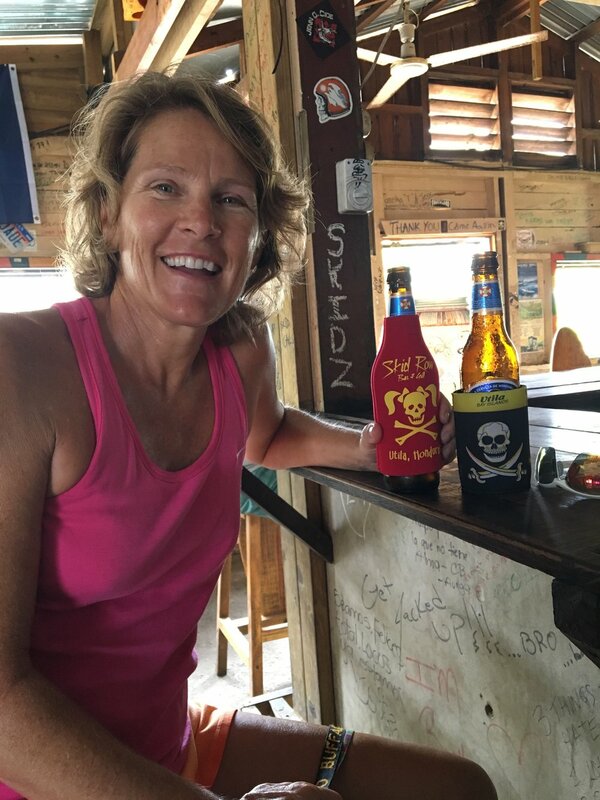 Anybody looking for a waterfront bar that needs a remodel? This one will be available for purchase soon. All of these places are pretty quiet and peaceful when we visit, which is usually in the daytime or early evening. They earn their wild reputations when the young people come out at night! Beers at these places and others are usually around 40-45 Lempiras, $1.70 to $1.90. But we found one little tiki shack across the street from the public beach run by a nice Honduran family who only charges 30 Lemps! A buck and a quarter to drink a cold beer in the beautiful water, plus I get to practice my Spanish! Cheap beer, friendly people in the orange hut El Castillo – wursts & German bier! We’ve also gone to a pretty nice restaurant called Mango Tango, and it too is waterfront. More expensive, but still not “expensive”. 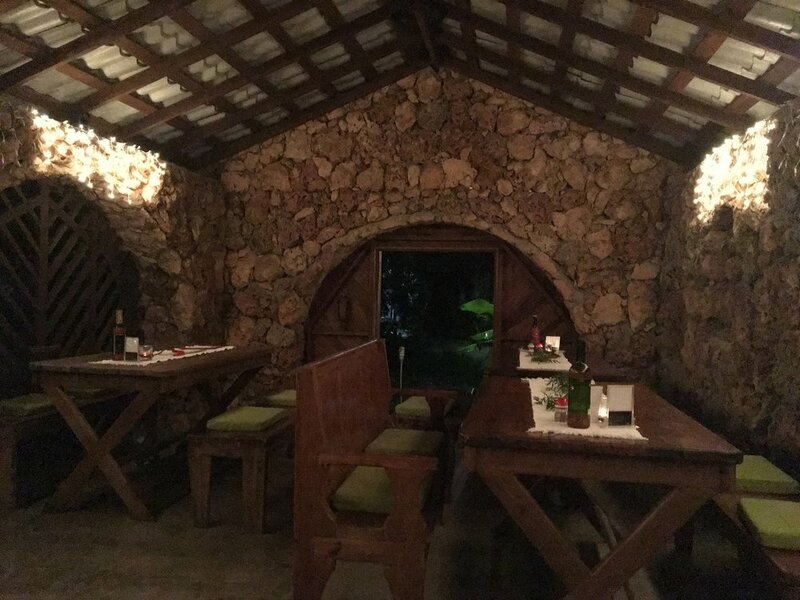 Last week we went to the hotel restaurant called El Castillo where our landlady runs the kitchen – it’s German fare until the end of Octoberfest, excellent wursts and home-baked brezel (pretzel), so delicious it gave us flashbacks to our Germany/Austria vacation a few years back! I don’t think we spent more than about $40 total at either of these “higher priced” places, and we’re looking forward to pizza at an Italian place down the road, so we’re doing well going out a bit without spending a lot of cash. We have to make up a little bit for the unplanned plane flights and pet expenses to get to Honduras. Our rent is less than it would be in Vieques so that helps our costs here. Breadfruit and young plantains – delicious! Speaking of expenses, there’s been some interest in how we’re doing with that. It looks like we’re spending safely under $2000 a month here, including food, drinks, rent, electricity, health insurance, the whole nine yards. As I’ve said before, we keep expenses low by cooking most of our food but also eating as much local product as we can. So beans and rice are really good and really cheap, unless you buy your beans in a can. We make a lot of quesadillas with local products, those are great. We bought huge Avocados from a kid on a bicycle, excellent! We found a great hot sauce from Guatemala that we keep buying over and over because we can only find it in a tiny little bottle! 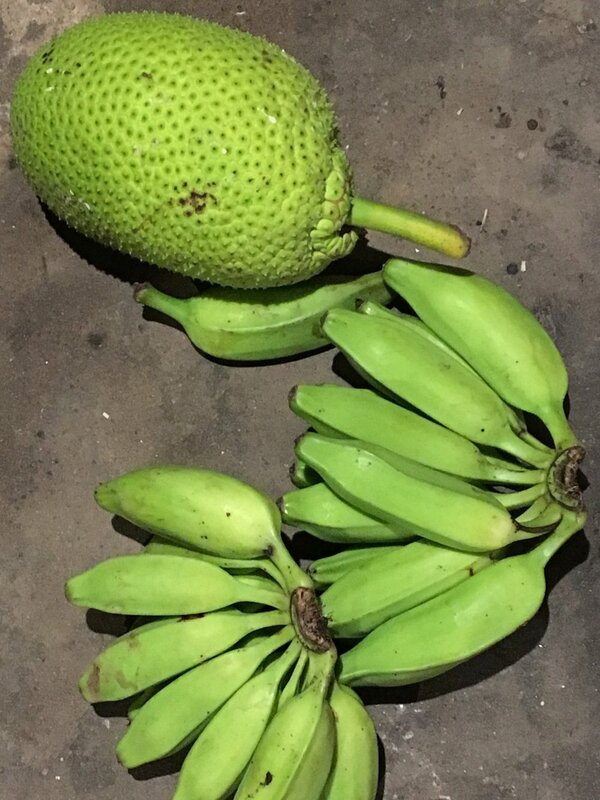 Breadfruit, star fruit, limes, plantains, all grow on the trees here and our landlord kindly gives us some (gratis) when he picks them. Chicken is reasonable when you get the local island chickens, pork as well. Eggs from the landlord (the chickens run around the property here) are only $2.25 a dozen and they are much better than the ones from the stores in town. The local bakery is a little expensive for bread and cookies but he’s such a nice guy we just have to support him. Seafood is cheap but you have to find the right fisherman to get what you pay for. We also splurge a little with spaghetti (with sauce from a jar – actually not too costly) and Chilean wine (really cheap and good quality). Our granola for breakfast is local, but the almond milk is Costco’s brand. It’s all pretty reasonable. Beer is also cheap but imported beers (they’re usually German) are twice the price of the local brews. Even local peanut butter and jelly is good here, and it’s 1/3 the price of Jif and Smuckers. We definitely spend a few bucks on Deep Woods OFF! And it’s worth every penny! We had planned to rent bikes long-term(ish) but they were expensive ($80/mo) and really terrible (like very rusty, bent wheel, and sketchy brakes terrible). So we just find ourselves walking a lot and it works out really well. We’ll take a taxi (tuk-tuk) once in a while if it’s raining for 3 or 4 dollars including tip. We may rent a 4-wheeler one day to do some more exploring. 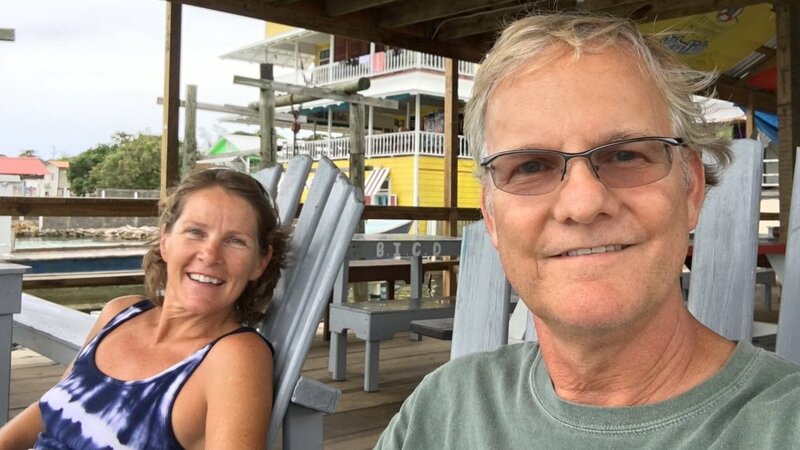 When we get a good break in the weather, we’ll probably dole out some more money to take a day trip to the Cays, some small islands off the southwest tip of the island. We’re told they’re beautiful, so we’ll report on that when we can. That’s pretty much it for now. Now that we’ve fallen all the way down to Skid Row, I guess we have to go back to Rehab! Oh, a final note on pronunciation. I have now heard the same local Utilian say “You-till-ah” and “Oo-tee-lah” depending on his mood. So, pronounce it however you(till-ah) like! TODAY’S SPECIAL: “I Love This Bar” by Toby Keith! Anybody have any good bar stories? Come on, I know you do! Bring it! Great pics, esp of you and Deb. And love that water. Wow $2000/month is damn good, I am impressed. Assume Health Care must be cheap, or are you using local witch doctors? ?? I replied to this but it got swallowed in the wires somewhere so I’ll try to reproduce it. The water is nice, but its been pretty cloudy lately with all the night time rain. I know I’ve been spoiled with some of the places we’ve been and the beaches we’ve seen. As for Health Insurance, our international plan is only $400/mo which is 1/3 of U.S. prices. I haven’t seen a doctor and hope not to. There are a couple of health clinics here, but anything bad and we’d have to go to the mainland on the ferry. Yeah, that definitely meet my definition of a dive bar! Maybe its the island vibe? Hi, Neat post. There is an issue together with your site in web explorer, might check this� IE still is the market chief and a big component of other folks will leave out your great writing because of this problem.